Donate your hair to make a wig for a woman fighting breast cancer. Breast cancer patients who undergo treatment often lose their hair. For many women, the loss of their hair is devastating, creating self-confidence issues and making their cancer treatments even more difficult. Fortunately for breast cancer patients, many charitable programs provide real hair wigs. Hair donation requirements are in place to ensure the best quality wigs for women with cancer. If you meet the donation requirements and you want to do something kind, donate your hair to a woman living with cancer. 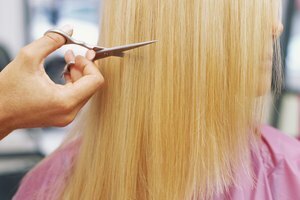 Read the eligibility requirements for hair donation for breast cancer patients. 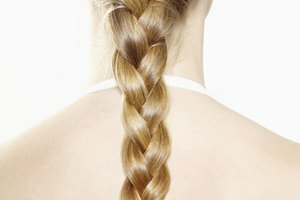 Hair must be at least 8 inches in length when pulled back in a ponytail and measured from the bottom of the rubber band to the tips of your hair. Your hair may be dyed with certain dyes, but must not be bleached, chemically treated or permanently dyed. Hair must also not be more than 5 percent gray. Cut your hair at home or at your favorite salon. Wash and dry your hair completely and gather your hair into a low ponytail at the nape of your neck. If your hair comes loose from the elastic band used to pull your hair back once it’s been cut it cannot be used as a donation. Using sharp scissors cut your hair just above the elastic hair band. Place your hair in an air-tight plastic bag with a zip-lock. Mail your hair donation to your chosen charity by placing the bag containing your hair in a padded envelope. When choosing a charity make sure to inquire whether or not they donate to breast cancer patients. Many charities, such as Locks for Love, only donate to children with diseases causing hair loss. Other charities, such as Pantene's Beautiful Lengths donate only to adult female cancer patients. Raiford, Tiffany. "How to Donate Hair for Breast Cancer Patients." Synonym, https://classroom.synonym.com/how-to-donate-hair-for-breast-cancer-patients-12082171.html. 04 October 2017.